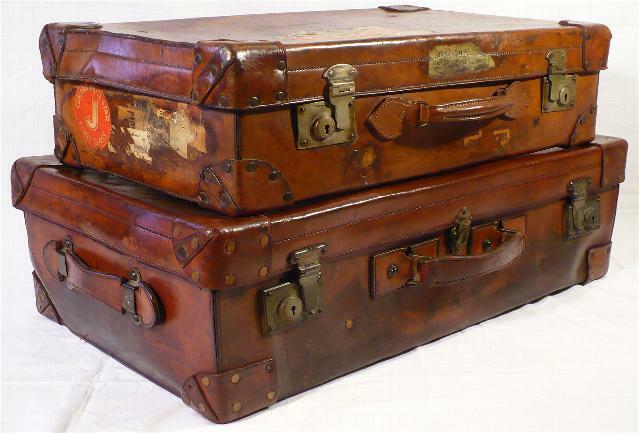 We specialise in trunks, cases, chests, portmanteaus and other vintage luggage from the 18th century to the 1940s, favoured for interior design, shop display, furnishings, linen and clothing storage, theatre props, themed venuesTV and film hire to name but a few. Our items are reminiscent of a bygone age of sail and steam, completely original and from the era stated in the items individual description. We also reproduce bespoke leather suitcase and trunk handles, using traditional methods and materials, replicating handles in exactly the same style and quality as the original. Please view our gallery for interior design ideas and portfolio. If you have any questions regarding our items, please do not hesitate to contact us or alternatively, visit us at Clocktower Market in the Royal Borough of Greenwich, London. Visit www.trunksandcases.com's profile on Pinterest.